Please note that above price is subjected to change and is for reference purpose only. Kindly contact Ford Nepal to get the latest showroom price. 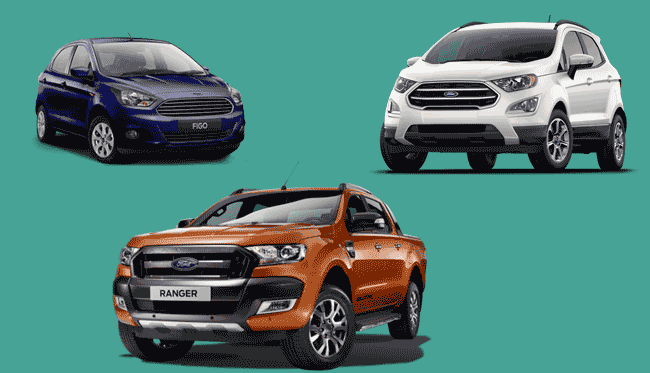 Note: Ford car and pickup price list was last updated on February 12, 2019. Ford car in Nepal is distributed by GO Automobiles Private Limited (GO Ford) which is the automotive division of Golchha Organisation. This organization has served Nepal for almost 80 years. Go Ford exclusively deals with Ford Automobiles & products in Nepal. However, Golchha as a group, holds many other automotive organizations. Go Automobile, partnering with global automobile industry leader, made its products accessible to people in Nepal. Company is committed to bring in first-class customer service both in its showroom and service centers. These showroom and service centers are equipped with highly skilled staffs and latest equipment. Go Ford has 18,000-square-foot workshop area with state-of-art facility in Nepal. Besides, it has 4,600 square foot showroom in Thapathali, Kathmandu. Ford cars are known for low cost, easy availability of spare parts and being worth the money. Current model of Ford Nepal includes Figo, Freestyle, Aspire, Ranger and EcoSport which are imported from India and Thailand. Ford car or SUV starting at price of just around Rs. 25-35 lakhs in Nepal, as listed above, makes it a favorable choice for customers with low-mid budget. Or you can message us your queries regarding Ford car price in Nepal or its specifications at our Facebook page.